Just when I think I’m ready to finish a project, I discover several fitting problems. 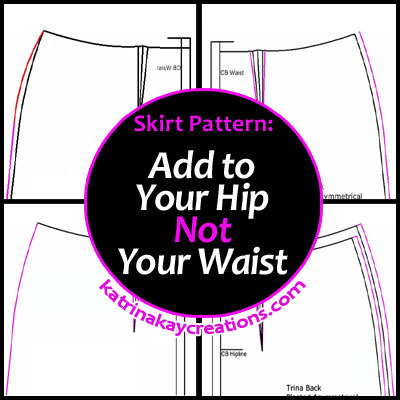 How is it that my waist fits fine, but the hip area is too tight? This is one of the problems I ran into in my effort to make my pleated skirt, (you can see part 1 of the pleated skirt here). I needed to add 3/8″ to each side seam of my skirt, but only at the hip-well mostly right above the hip line. But, I needed to do this and keep the same waist measurement because my waist fit fine. It was just the area above the hip line giving me a problem. So today, I’m going to show you how to add to your hip, not your waist (or without changing your waist measurement). When I say hip, this also includes the area directly above and below your hip line. It just so happens, I only need the extra room directly above my hip line. 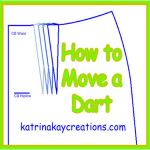 Note: I only use this method if I have to add 1/2″ or LESS to my side seams. For a detailed tutorial, see the video below. Great way to do this adjustment and so clearly presented. Perfect for me. Thanks so much! You’re welcome, Sandy! Thanks for reading and watching. Happy New Year Katrina Kay!!! I can use these tips!! Happy New Year to you, Dara. I’m glad these tips were a help to you. I’ve inherited some gorgeous vintage patterns. I’m wondering if you know how to make them into a plus size? I’ve thought of taking them to a copy center and having them enlarged, but I wouldn’t have the faintest idea on how much to enlarge them. Hi Caroly, your patterns would need to be graded to your size. 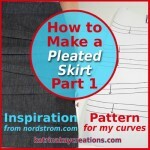 BurdaStyle has a course on this called Plus Size: Pattern Grading at http://bit.ly/1uLEMHj. You can look at the course description for details. If you aren’t familiar with pattern grading you can also google it and you may find some free information. Katrina, this is so nice. I have never seen it done like this before. Thanks so much! You are correct, I have been busy traveling and doing daycare this summer! Happy National Sewing Month!! You’re welcome, Dara. Happy National Sewing Month to you too!